Today’s organizations are seeking to fully leverage their two greatest assets, their people and their data. To do so, they’re seeking a modern analytics platform that can empower the entire enterprise. An enterprise-ready platform supports business agility without sacrificing governance or security. 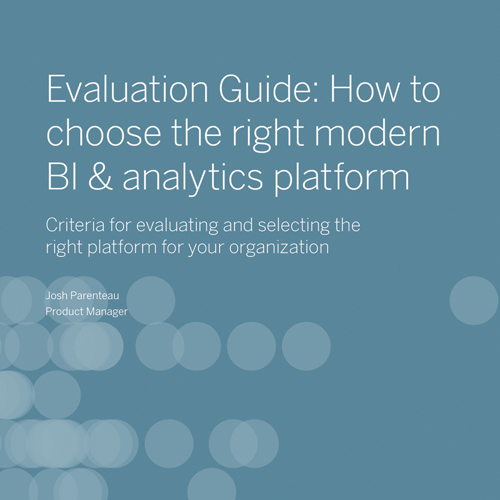 Here are five things to consider when evaluating a modern analytics platform. 1. Can you visually explore your data? Choose a visual analytics platform that lets you naturally solve problems. This platform should let you visually explore your data, offering visual feedback as you go and helping you uncover insights. It should also enable you to share your findings by creating beautiful visualizations—all from the same intuitive interface and without the need to switch between different products for different types of analysis. Don’t just watch a demo; sign up for a free trial and take the tool for a test-drive. Try to answer a set of questions, not just one. See if you can dive deep into your analysis and conduct limitless exploration without coding or programming knowledge. 2. Do the deployment options support your existing data strategy? Even the most powerful analytics tool is useless if it can’t easily connect to your data. The right analytics platform offers optimized native connections to your data, no matter where it lives, so you can get to your analysis faster. It lets you analyze your data live without having to bring it in-memory. And it queries your databases with optimized performance to help you make the most of your database investments. This platform should also give you the choice to deploy your analytics wherever you want—in the cloud, on-premises, or a hybrid of both. It should integrate seamlessly with your existing data strategy instead of forcing you to change or buy additional products. It should also embed easily into your company portals and other enterprise applications so you can meet your users where they are. 3. Does it enable governed self-service analytics at scale? In order to maximize the value of your data, you need to deploy governed self-service analytics at scale. And in order to empower the entire organization, you need an analytics tool that the business loves and IT trusts. The right platform empowers organizations to take an IT-enabled, business-led approach to analytics. It enables IT to establish a secure and governed environment that protects the data and ensures its integrity without compromising business agility and innovation. The right platform enables everyone, even non-analysts, to have conversations around data and leverage insights. It helps organizations foster a culture of analytics and make data central to everyone’s business decisions. 4. What is the total cost of ownership? When evaluating platforms, consider the total cost of ownership. Don’t just base your decision on the price tag; conduct a full comparison. Add in all the other extra components that you’d need to make that free platform work in your enterprise environment—both now and in the future. 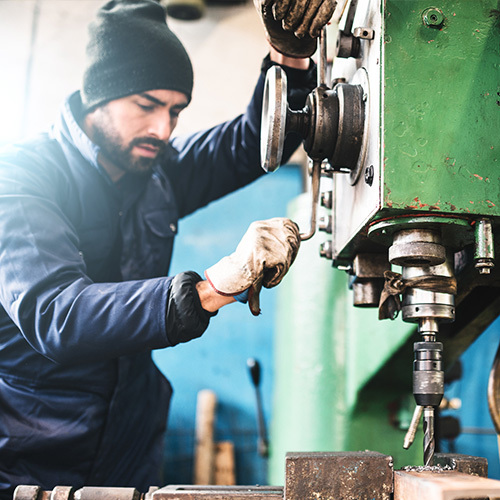 Free tools can add up to a big cost. They often require more products, people, and infrastructure to meet your enterprise-grade requirements. And you’ll likely have to figure out how to make everything work on your own. 5. Is the company committed to the success of its customers? Invest in a company that is invested in your success. Choose a company with a mission to empower people with its analytics platform. Has the company invested years of research and development into its analytics platform? Does its history indicate the company will continue to innovate? Does it prioritize user enablement to help customers drive adoption? Rely on the experience of your peers. Are the customers passionate? Have they had success with the product? Their passion and enthusiasm are a direct indication of the success they’ve have had with the product as well as the demand for the skill. It also means they’ve built up a rich knowledge base that you can then leverage to drive your own adoption and success. Many tools claim “Tableau-like” capabilities, but it’s important to understand what you’re really getting with alternatives. This short video shows you what’s different about Tableau vs. other BI tools. Differences matter, and as you’ll see, they add up to a lot. AmeriPride is one of the largest uniform rental and linen supply companies in North America, operating over 115 production facilities and service centers. AmeriPride’s Chief Information Officer explains how the company gets more value from its data by balancing self-service analytics and access, while maintaining order and data security. 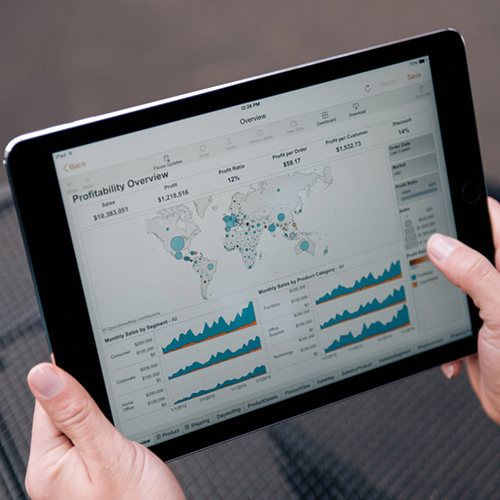 Read the top five reasons Tableau is an industry leader in BI and analytics, then get the report.